School is finally out for the summer. I took a quick trip to visit my parents for Mother's Day, and now I'm home again and hard at work. One project for this summer is creating a pair of stays for a fashion show that I will be doing in Lancaster at an encampment at Rock Ford Plantation: Revolutionary Rock Ford. The fashion show will exhibit reproduction clothing from the working to upper classes, showing the changes in fashion, garment styles, and fabrics used for each level of society. 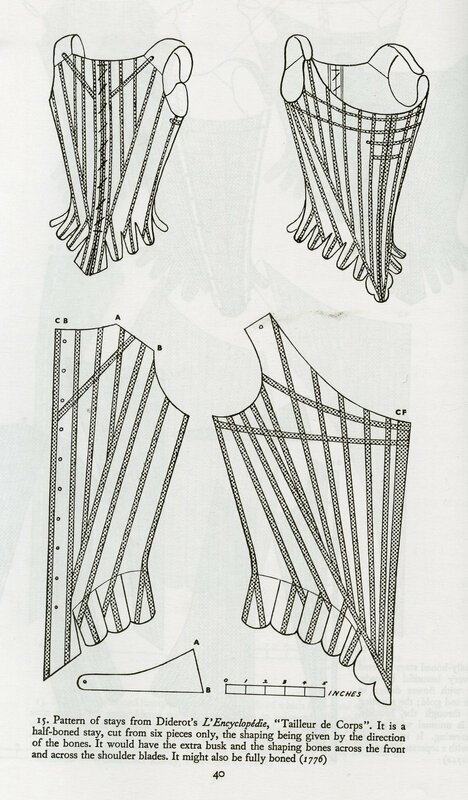 I will be creating a pair of stays using the pattern for the Diderot stays. 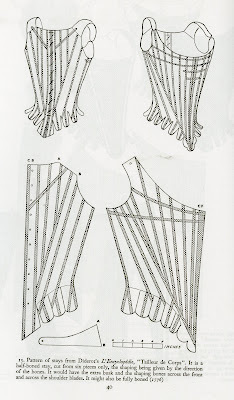 To create the pattern, I simply took the graphed pattern in 'Corsets and Crinolines' by Norah Waugh to the copier and blew it up until it was the correct size. I'll admit, I had actually never done this before. It was easier than I had imagined. I just created a pair of stays using this pattern for a production of 'The Rivals' that will debut at Carnegie Mellon University in the fall. Those stays were made from two layers of coutil, 1/4" steel boning, and a layer of beautiful off-white duchess silk satin as the face fabric. They will be bound in a contrasting color. I was inspired by the two originals pictured above. 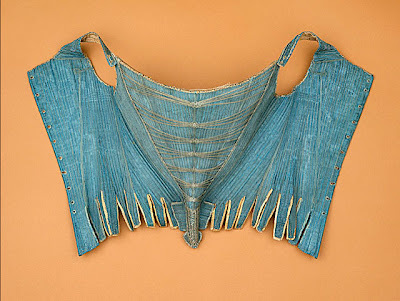 I would like to do fancy ties and bright binding (or possibly piping since these are theatrical) or something similar to the delicate work on the stomacher of the blue stays. For my reproduction version I plan to use two layers of coutil (not authentic to the period, but coutil is excellent for supportive undergarments). 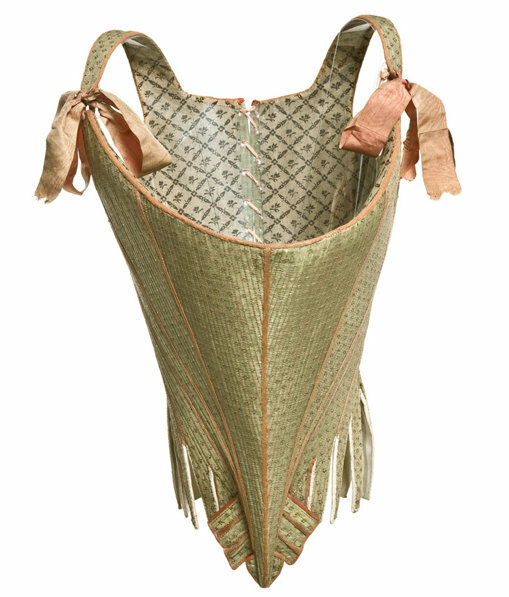 I purchase my corset supplies from corsetmaking.com. I'm toying with the idea of experimenting with cable ties on this pair of stays, but I prefer to use 3/16" wide cable ties that I already have in my stash. I like the idea that the stays would be lighter than steel boned stays, but I'm afraid that the cable ties will be too flexible. There is, of course, the option of doubling them, but that creates a thick bone...probably not what I want. I purchased the steel boning and will experiment more when my supplies arrive. The face layer of the stays will be silk. I have a lovely silk damask that I may use. One half-boned stays, the boning channels did not show, for aesthetic reasons, so I plan to layer my silk over the coutil layers once the boning channels are sewn. There are several useful articles on the marquise.de site regarding stays and their construction. I'll be sure to post more updates as I begin constructing my stays! It was so very good to see you on Mother's Day. Best wishes for your sewing room table projects. Re your dilemma with steel boning vs cable ties... what about reeds? Or have you had problems with them in the past? I am going to give them a go! Nothing ventured etc! Yes, I've tried using reed before and was satisfied with the results (http://blog.historicalfashions.com/2009/06/stays-projects.html). But I used them before for fully boned stays and I'm not sure that I want to trust the reeds for half-boned stays, fearing that they might break. I'd love to hear how the reed works for your pair of stays! It's certainly cheaper than using steel boning - and much lighter weight! Beautiful pictures. And interesting idea of cable ties for stays! I just discovered your blog and it's fascinating! I'm an apparel design student (undergrad, though) and I have the opportunity to take costuming classes in the next few years. What you're doing is really inspiring.